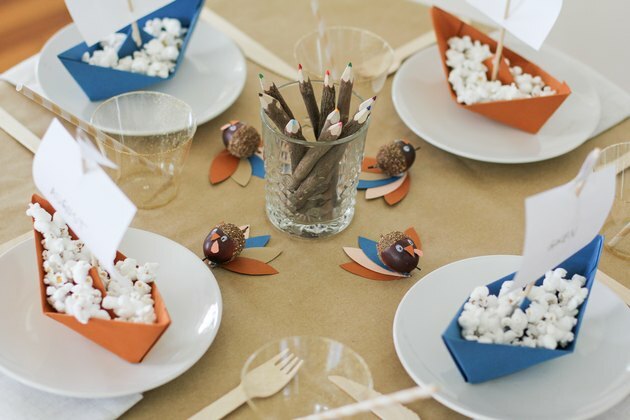 This Thanksgiving, set a tablescape <ahref="https: www.hunker.com="" 13714490="" these-beautiful-thanksgiving-table-settings-are-seasonal-eye-candy"=""> </ahref="https:>for little ones that's festive and full of interactive fun. You can still keep it chic by honing in on a specific color palette that coordinates with the main table while also infusing seasonal touches that spark the interests of your youngest guests. 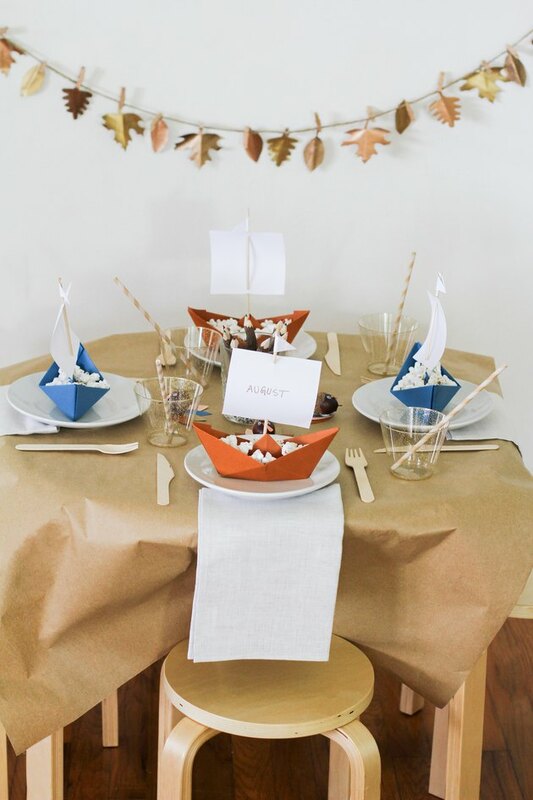 The food may be the star of Turkey Day (not to mention this edible table runner), but we guarantee this adorable kids' table will have everyone gobbling up the charm. 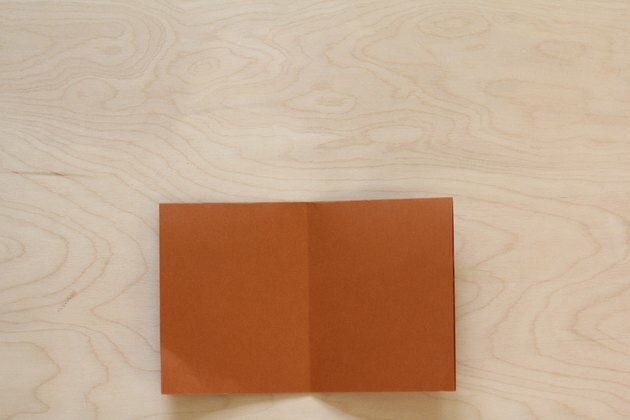 Below, our step-by-step guide on how to set the scene. 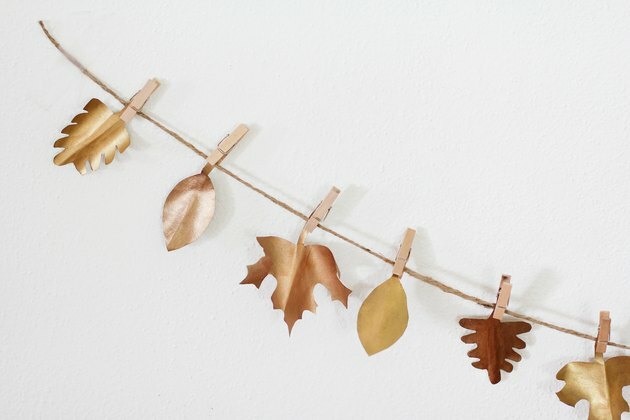 A gilded leaf garland that shimmers and sparkles overhead brings in the beauty of the season. 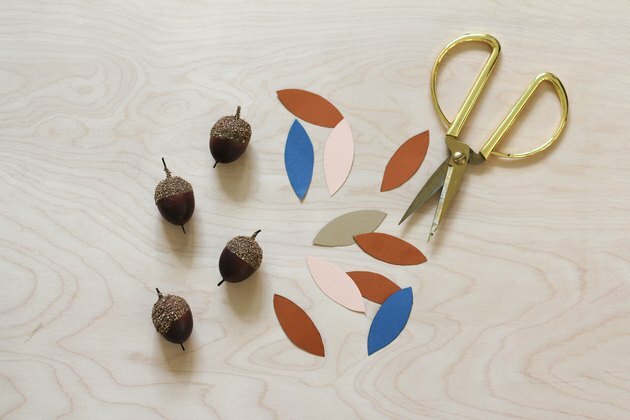 First, download and print our free Thanksgiving Kids' Table template and cut out the leaf shapes. 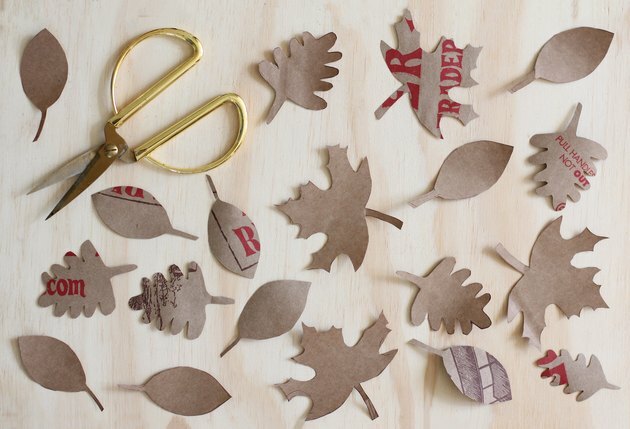 Trace six of each leaf shape onto recycled paper bags and then cut them out. 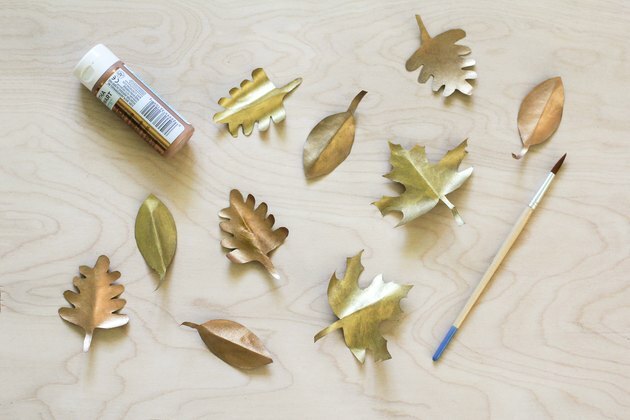 Paint the leaves with a variety of metallic paint colors (we used gold, copper, and bronze). Allow the paint to dry and then crease each leaf down the middle to add dimension. Cut a 5-foot-long strand of twine and clip the leaves to it with mini clothespins, spacing each leaf about two inches apart. Watch their eyes light up with delight when they encounter turkeys fashioned from acorns, which double as decor and party favors. 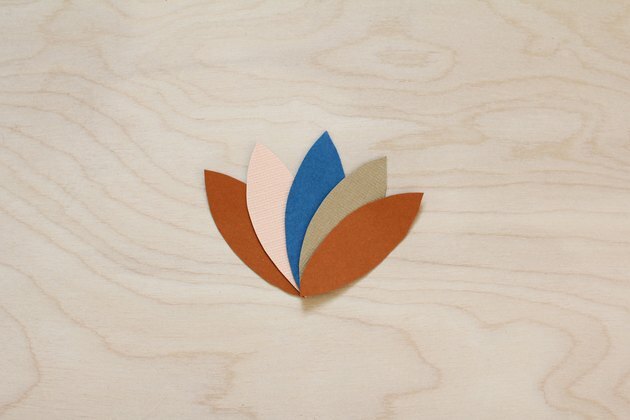 Cut out the turkey shapes from the Thanksgiving Kids' Table template and trace the feather shape onto various colors of cardstock or paper (we used rust, indigo, blush, and tan). You'll need to trace and cut out five feathers for each turkey. Hot glue five feathers together, overlapping them slightly in a "fanned" shape. 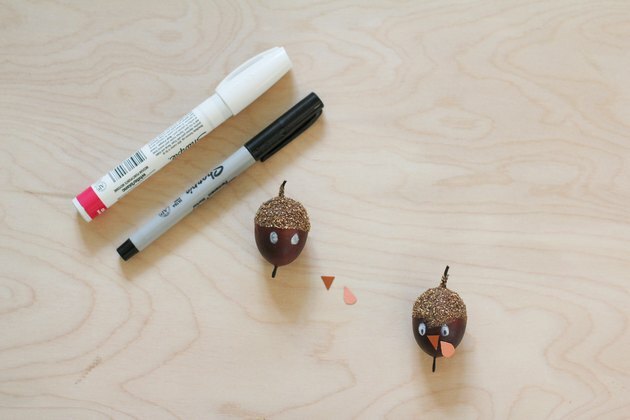 Use a white paint pen to draw two eyes on each acorn. Let the paint dry, and then color in two pupils with a black marker. 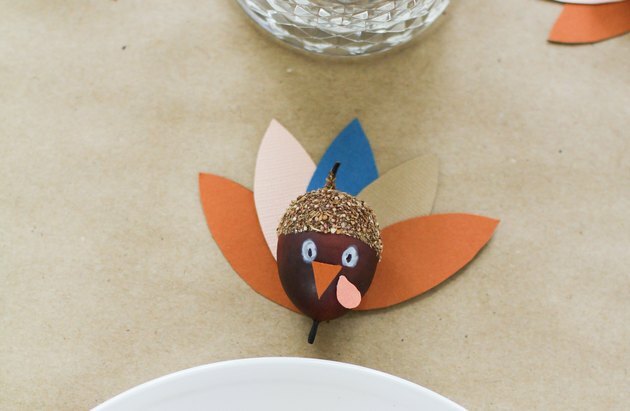 Trace and cut out a beak and wattle shape for each turkey on either cardstock or paper, and glue them in place on the acorns. Then glue the turkey acorns to the feathers. 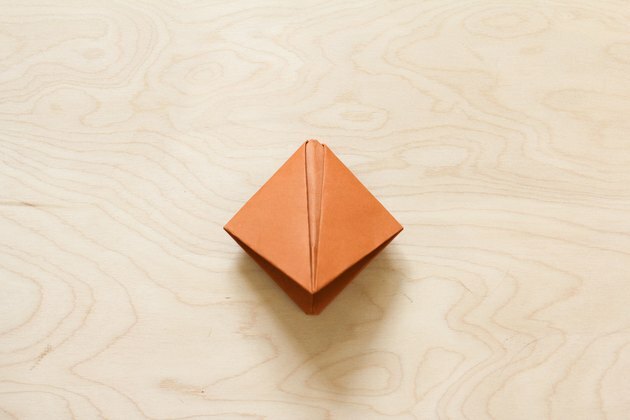 Origami Mayflower place cards offer a historical connection to the holiday and can be filled with snacks to tide them over until dinner. 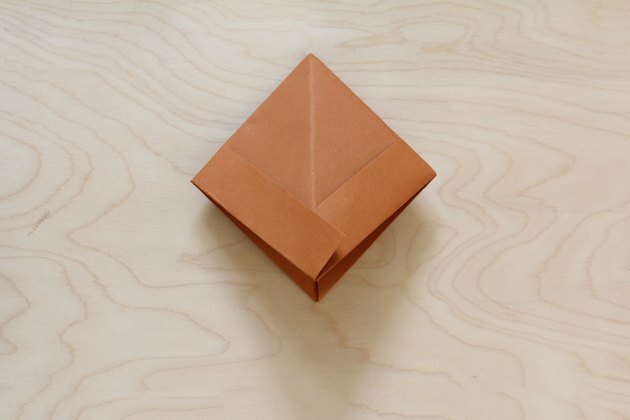 First, fold a piece of paper or cardstock in half from top to bottom. 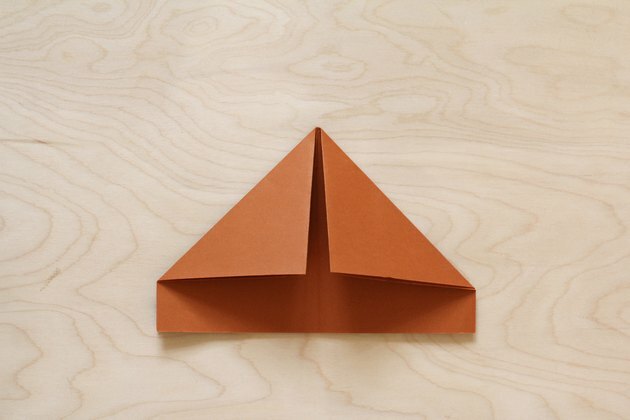 Fold the paper in half again, this time from side to side, to create a crease line down the center, and then unfold. 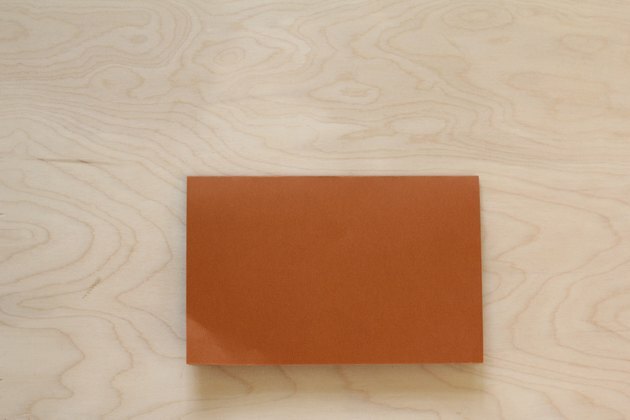 Fold both top corners down toward the middle so they line up with the center crease line. Fold up the bottom flap on each side. 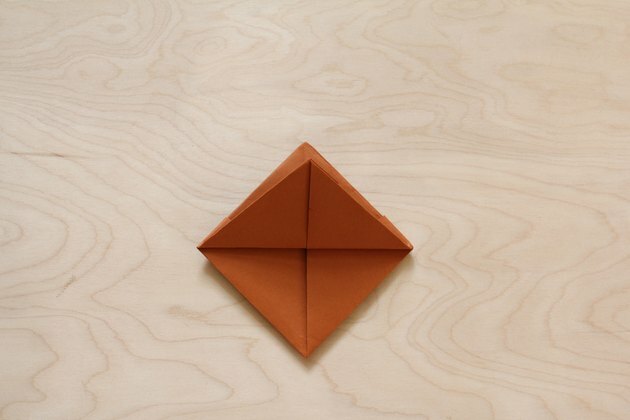 Put both thumbs inside the middle and pull the sides out to flatten the paper into a square shape. Tuck one corner flap under the other. 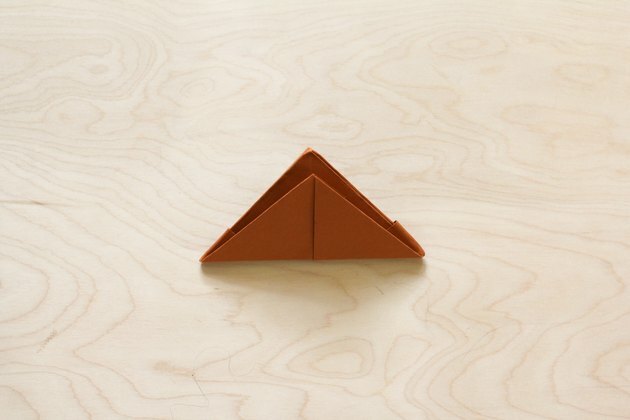 Fold the bottom point on each side up to meet the top point. Put both thumbs in the middle again and pull outward to make a square. 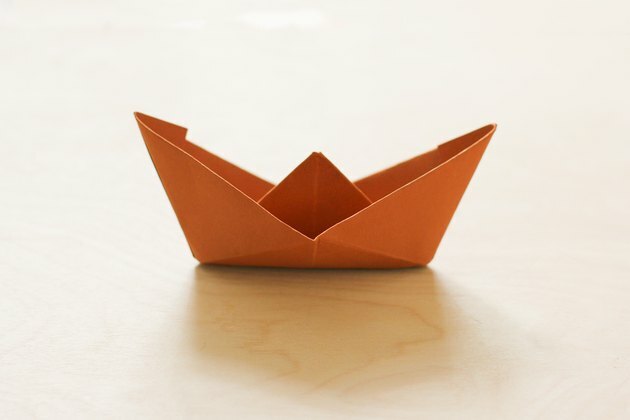 Pull the corners down and outward to open up the boat shape. 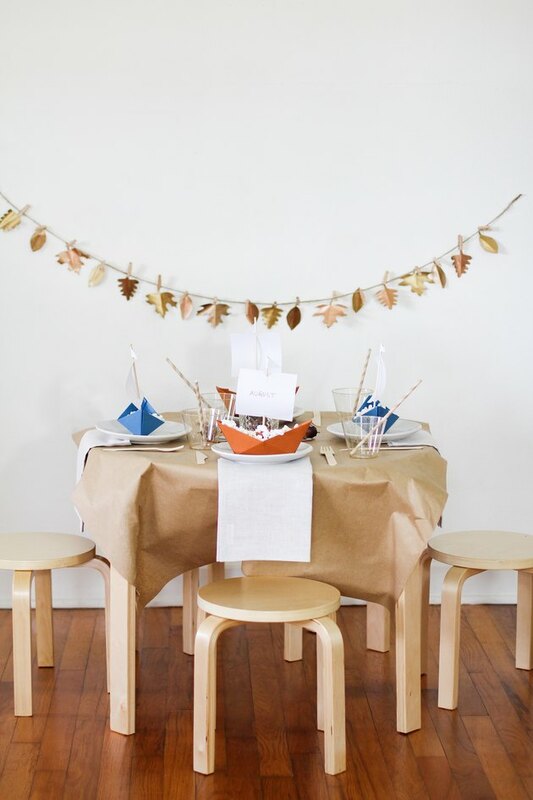 Cut out the sail and flag shapes from the Thanksgiving Kids' Table template (we just used white printer paper) and punch a hole on the top and bottom of each sail. 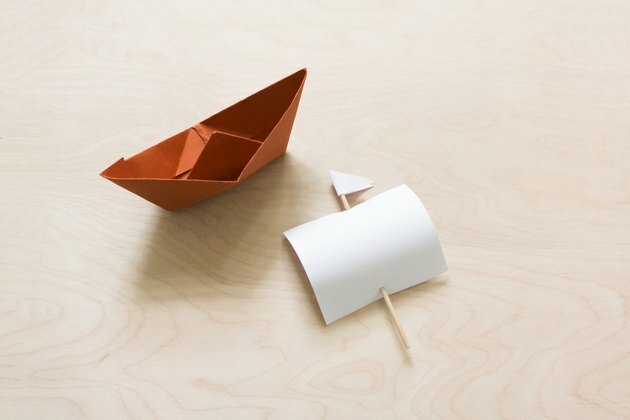 Feed a bamboo skewer through the holes, fold a flag in half above the sail, and glue it in place on the skewer. 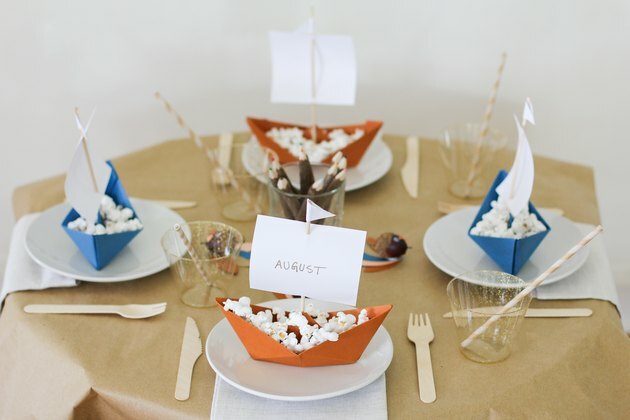 Glue the skewer in the center of each boat and write a guest's name on each sail. 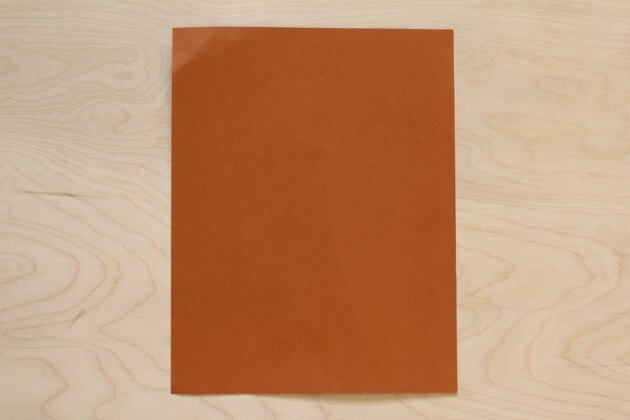 Kraft paper makes the ultimate low-maintenance tablecloth against spills, and when paired with twig colored pencils provides ample opportunity for youngsters to draw and doodle while the grownups enjoy a distraction-free meal. 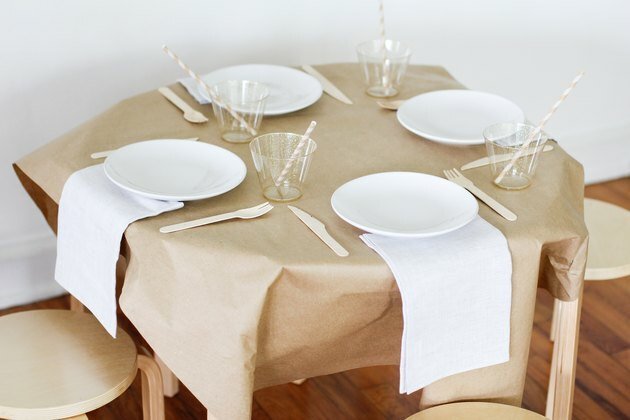 Cut a long piece of kraft paper and place it on the table to act as a tablecloth upon which kids can draw. Set the plates, cups, and utensils on top. 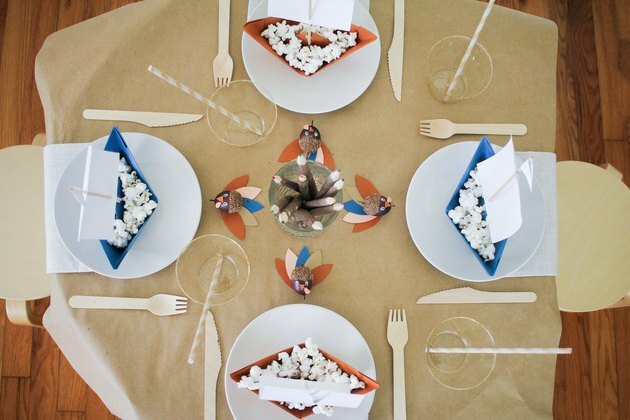 Drape a napkin underneath each plate, and place a straw inside each cup. 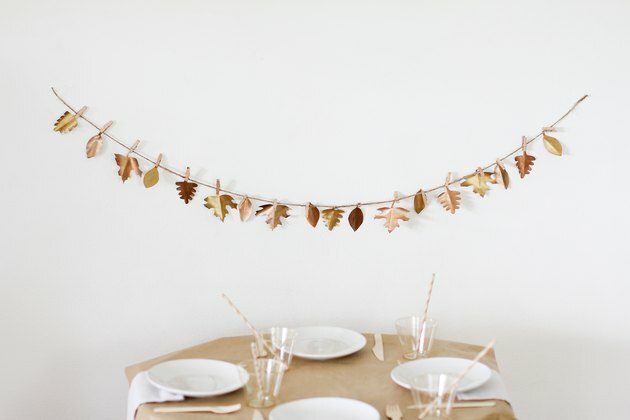 Hang the leaf garland above the table with tape. 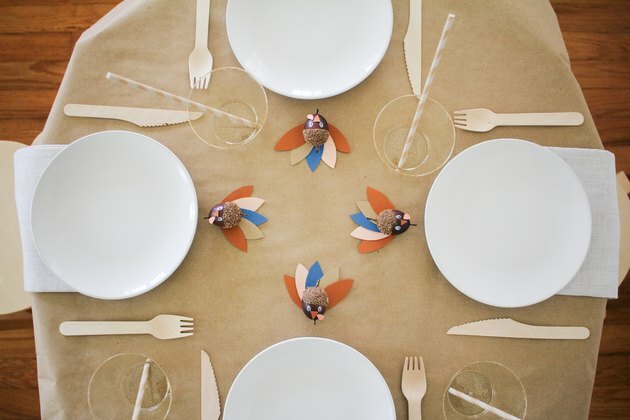 Place an acorn turkey above each plate. 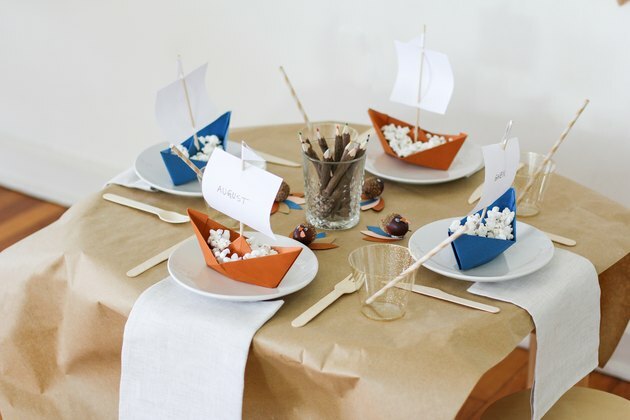 Set a Mayflower place card on top of each plate, and fill each boat with light snacks like popcorn, pretzels, or trail mix. Lastly, put the twig colored pencils inside a jar or glass and set it in the middle of the table. 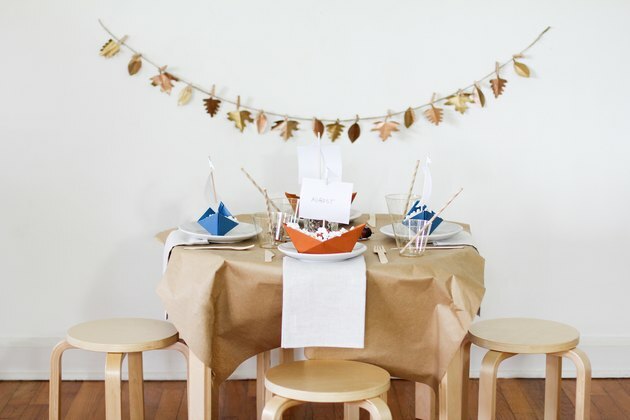 And now you have a swoon-worthy table at which any kid (or adult) would be thankful to dine!